Docked at the Legacy Harbor Marina in Ft. Myers. Great place to stay and reasonably priced. Pete and Kristen joined the adventure in Ft. Myers. We decided to have lunch before we packed up the boat and chanced on Grimaldi's Pizza. Who would have known you could get a pizza as good as any New York pizzeria right here in Ft. Myers. It was delicious. 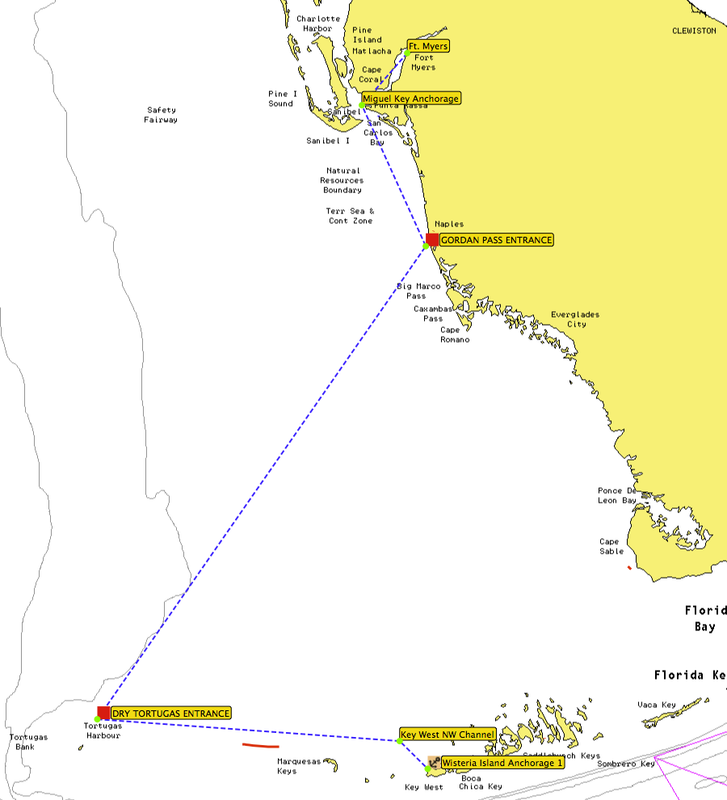 Our first anchorage leaving Ft. Myers was in the Caloosahatchee River off of Miguel Key. It turned out to be quite nice. 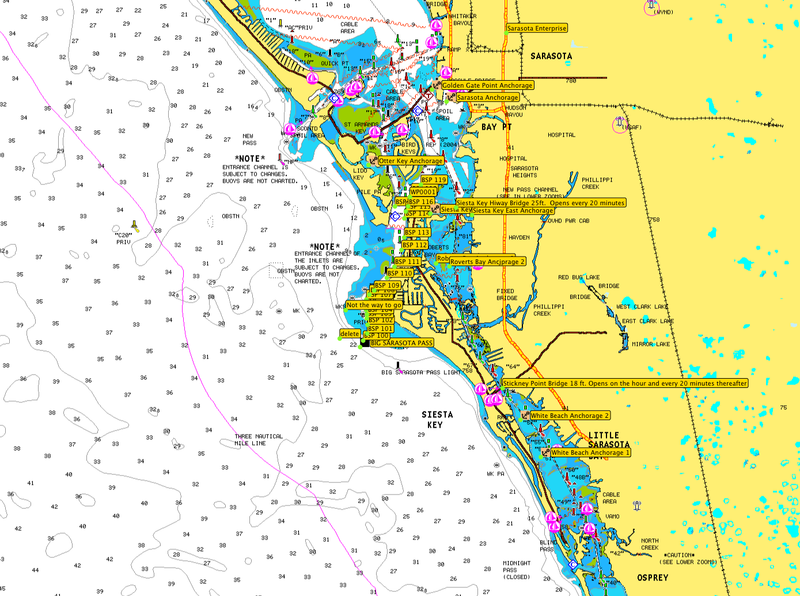 We were up early the next morning and had a great sail down to Marco Island with offshore winds and flat seas. We anchored by Coconut Island and had a nice swim. Then we motored up to the Piggly Wiggly and did a bit of provisioning. We had to make a decision, go to Shark River and do the Glades or jump straight over to the Dry Tortugas from Marco. We decided on a straight shot to the Tortugas only after setting sail for the Glades. Thunderstorms over the Glades made the decision for us. Our Anchorage at Coconut Island the morning we departed for the Tortugas. Brother Pete enjoying the Miquel Key anchorage. We set out for the Dry Tortugas with thunderstorms in the area. We had a four of five hours of uneventful nice sailing. But we were eventually chased down and engulfed by thunderstorm after thunderstorm that brought torrential rain, lightning, and high winds that lasted through the afternoon and into the early morning. Thunderstorms line up and plague us all afternoon and night. Captain Pat dealing with the stormy conditions. We were nailed by six thunderstorms that afternoon and night. We were all suffering a little from sea sickness. Kristen had crawled up into the forward bunks and lay there in her protective cocoon. Pete was hanging with me in the cockpit as best he could for support. I was getting buckets of rainwater poured over my head as the rain hit the sails and ran down and funneled just above my head. At one point during the night I had an encounter with a shrimp boat as I tried to determine its direction and speed and pass without incident. It took nearly an hour to pass as we were going within a tenth of a knot difference in speed. It was all very surreal as exhaustion was becoming a problem. At 3 AM, caught in another violent thunderstorm, I threw in the towel. I could go no more. So I turned the rudder a bit to angle into the wind and waves and went below and collapsed into my bunk. The passage was turning into one of the most uncomfortable to date. I roused at daybreak and began figuring our position and a way into the Dry Tortugas. We were only 15 miles out at that point. We picked our entry and motored our way to the most remote national park in the lower 48. Our first look at Ft. Jefferson and Garden Key. Our anchorage is just on the other side of the Fort. Ft. Jefferson as it sits on Garden Key. Its strange to see such a structure "floating" out in the middle of the ocean. Mary Annie sits to the right at anchor off of Garden Key. We anchored just off of Garden Key with a great view of Ft. Jefferson. We were at the Dry Tortugas for three days and had a chance to explore the Fort, snorkel at Loggerhead Key, and do a little fishing in the area. We met a family with two girls who snorkeled Loggerhead with us. It was a very nice day snorkeling with amazing variety of fish. We also witnessed the processing of Cuban refugees who had just landed on the island on a small boat. A half swamped Cuban boat that at least 6 Cuban political refugees arrived in. George the Crocodile swims with swimmers. We left for Key West after three days and had a glass smooth motor all the way. Sunset during our amazing crossing from the Dry Tortugas to Key West. Around 10pm the moon rose over the horizon and I veered sharply to keep from hitting it thinking it was a ship. Pete and Kristen enjoying the smooth ride. Quite the contrast from our passage from Marco Island. Pete and Kristen fly home and Darryl flies in. Next destination: Abaco Bahamas. My wife Amy met me Sarasota for a couple of days touring the city and then for a week on the boat on our cruise to Ft. Myers. I would take the ICW for the entirety of the trip. For the second time in two years Amy would be on the boat on the hottest week of the year. Even so we had a nice relaxed time and enjoyed the cruise. Amy is a knitter so we hit all the yarn shops in Sarasota. Here is a coral reef in yarn. We toured the Marie Selby Botanical Gardens on the waterfront in Sarasota. We enjoyed some good food and drink in Sarasota. The first day of cruising was from Sarasota to White Beach. Second anchorage was at Venice. We couldn't get an acceptable slip at the marina so we anchored out in inlet. There were swift currents but the anchor held for the night. I wouldn't want to do this in windy conditions. Here is our Anchorage in Cayo Costa State Park on our third night out. We met my brother Pete and friend Kristen in Ft. Myers where Amy flew home and I acquired new crew. 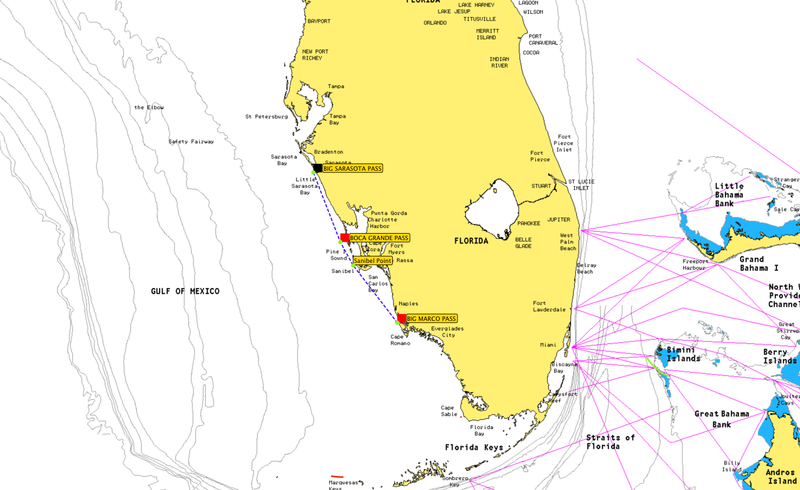 The next leg was from Ft. Myers to Dry Tortugas to Key West. After my month away from sailing, I returned to Sarasota for more. I had some time to kill before my wife joined me in Sarasota, so I decided to sail down to Marco Island for a couple of days and meet some friends that were going to be there on vacation. 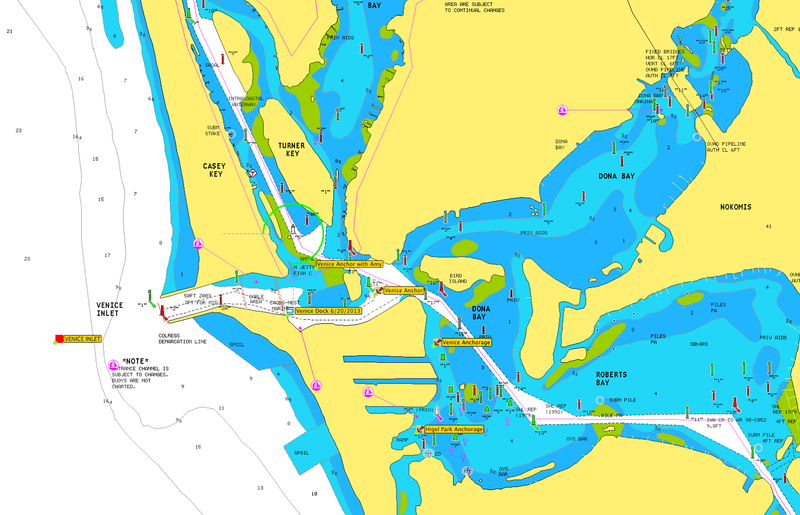 I got some directions for exiting Big Sarasota Pass and it's shifting sands from the dock master and headed out for Marco Island in the morning. Just after the above pic was taken, a coast guard transmission came over the radio of this storm producing 60 mph winds. It was headed my way so I decided to motor my way out of harms way. After cranking the engine and putting her in gear I realized I had no engine thrust, not being able to make more than 2 knots speed. I decided to anchor out in the gulf in 50 feet of water and check the prop. Being solo and swimming and diving around the boat untethered with no life jacket 8 miles out in the Gulf with an approaching storm is not much fun. I found I had a prop that was totally fouled by barnacles. It took 10 to 15 minutes of furious work to get her cleaned up. I boarded the boat with bleeding hands from the sharp barnacles but thankful the task was completed and off I went at 6 knots trying to out run the storm, which I did. I decided to sail all night instead of spending the extra hours making anchor in Charlotte Harbor. 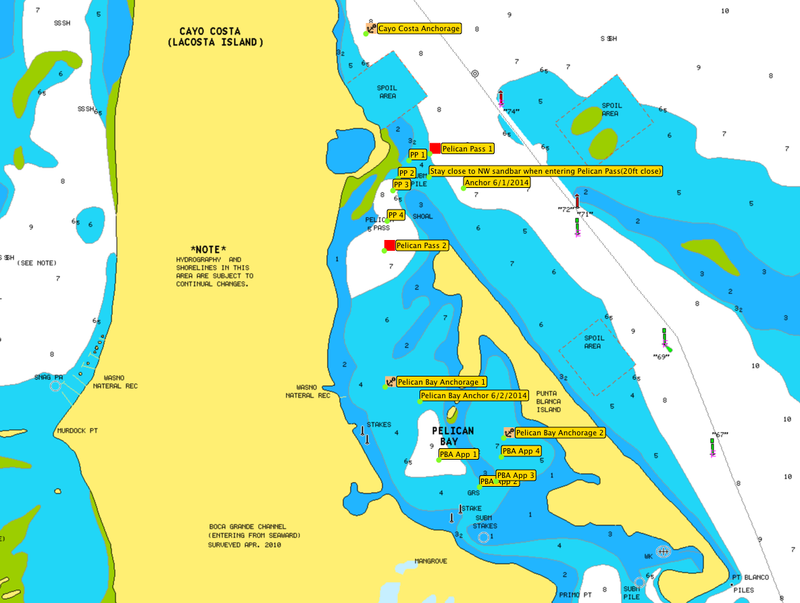 It turned out to be a very bumpy and uncomfortable night of sailing that is so often the case in the Gulf of Mexico with cross seas and variable winds. 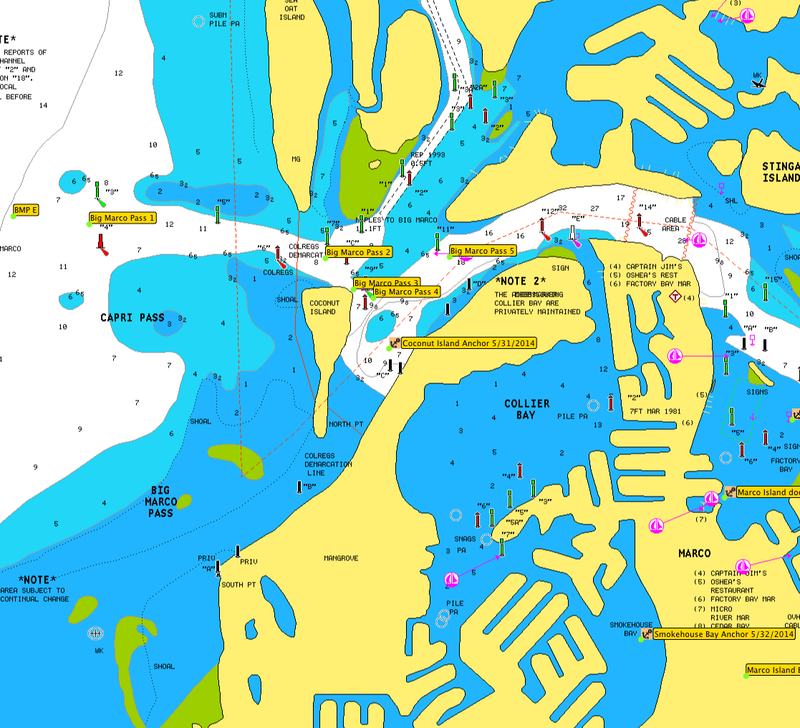 Marco Island Anchorages: the first night after my overnight crossing at Coconut Island and my second night at Smokehouse Bay. I arrived at Marco around noon on May 31st. I took a nap while on the hook at Coconut Island before provisioning at the Piggly Wiggly that afternoon. 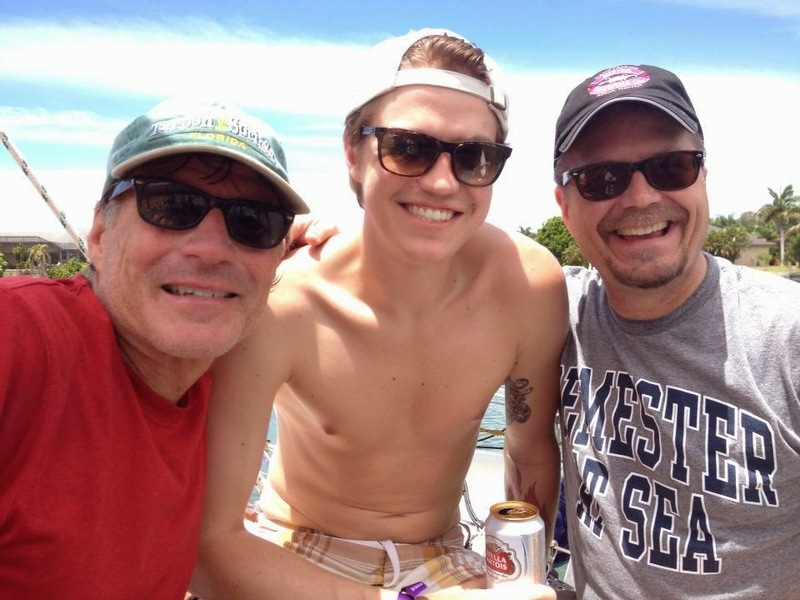 The next day I picked up the James family at Piggly Wiggly dock and we had a great time sailing in the Gulf. The next day I headed back to Sarasota to ready the boat for my next crew member, my wife. I decided to stop by at Cayo Costa State Park and tour the park and relax. There was stormy weather all the way from Marco to Cayo Costa. I did not make the entrance to the anchorage at Cayo Costa due to darkness. It is a very narrow channel running into Pelican Bay. 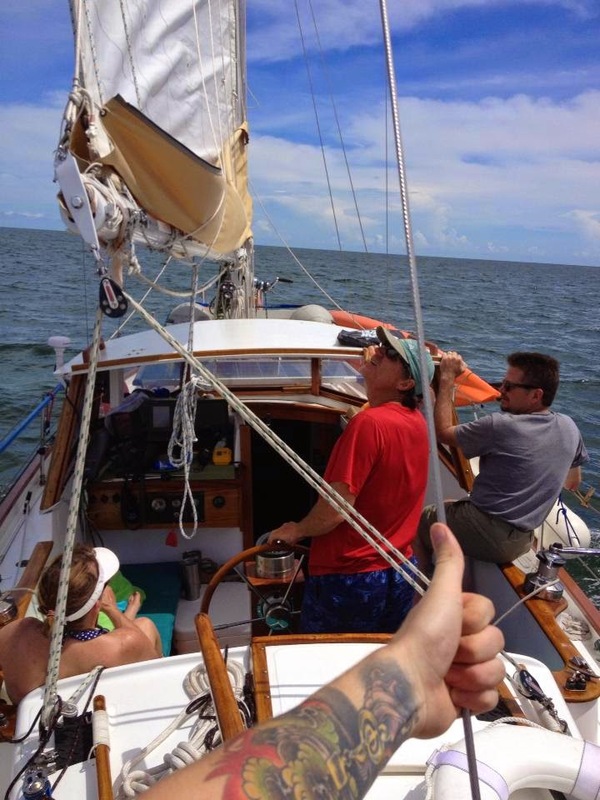 I anchored out in Charlotte Harbor and was pounded by wind and waves all night. The next morning I was up early and motored into Pelican Bay and slept most of the day away. I toured the park the next day on June 2. Below are pics of the anchorage and the park. 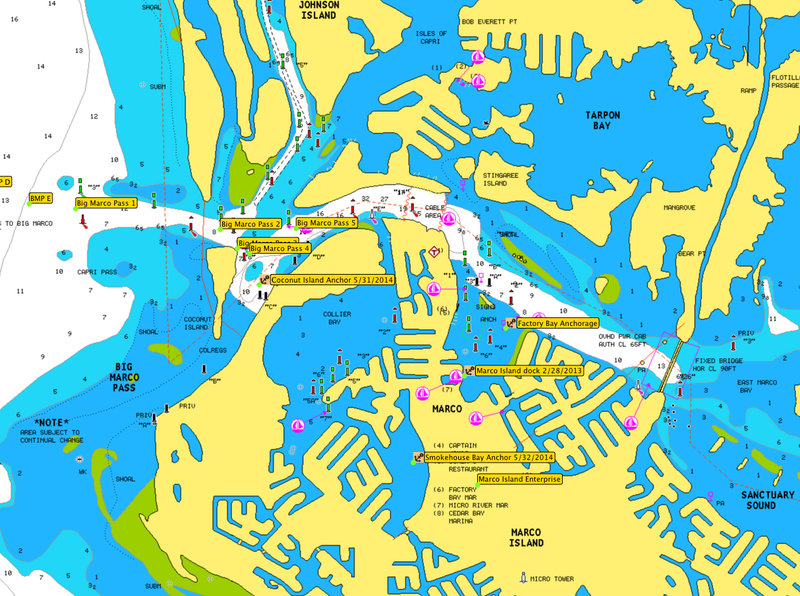 After touring the park and spending one more night in Pelican Bay, I headed out for Sarasota the next day on June 3 and had a great sail for most of the trip. The highlight was some energetic and playful dolphins that swam alongside for a bit.